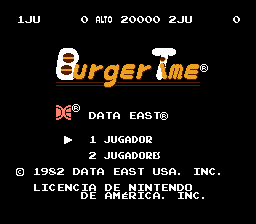 NES/Famicom port of the arcade hit, Burgertime. 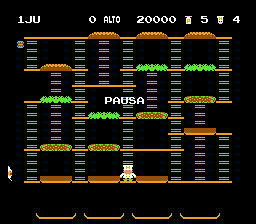 This is a classic arcade game where the player controls Peter Pepper, a chef, being chased by evil food. Peter Pepper’s goal is to walk over large portions of food in order to build giant hamburgers. Each burger is composed of two buns, meat, and vegetables. 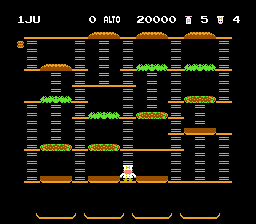 When all four hamburgers are completely built and stacked on the plates at the bottom of the screen, the next level begins. Peter Pepper can escape the evil food by sprinkling pepper at them. Another way to rid the evil food is by crushing them with the giant portions as they fall to the next platform. 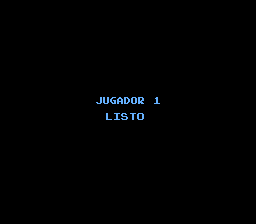 Translation to Spanish for “BurgerTime” for the NES.